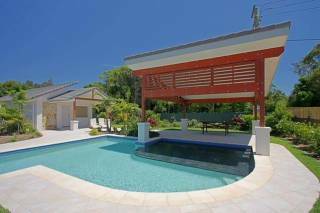 Here you will discover a thoughtfully designed residence in which you can relax and access all of the attractions of Byron Bay. From the central location of Byron Palms, the Palace Cinema, Citrus Gourmet Deli and the popular Green Garage are all less than 5 minutes away. Only a further 200 metres on foot and the shops and restaurants on Jonson Street commence. You can reach Main Beach in a level 15 minute stroll, opening up access to the iconic spots of Clarkes Beach, The Pass and the Lighthouse Walk. We offer king and double beds and twins to suit your needs. Each room in the guesthouse has its own en-suite, air conditioning and flat screen TV. With exclusive bathroom products, and your room serviced daily including fresh towels as required, your stay will be made even more enjoyable. Our guesthouse rates commence at $145 per room per night in the low season. 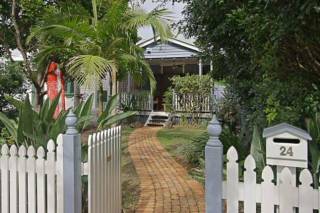 Brand new, renovated facility with air-con, flat screen TVs, en-suites and an easy walk to Byron's CBD and Main Beach. Free wifi, sun decks, sun lounges, a calming garden view, continental breakfast, living areas and all day tea and coffee making facilities. The breakfast bar is a convivial place to share information and ask questions about all there is to do in Byron. So close to everything. Cinema, restaurants, supermarket, town centre and the beach. Browning Street is on the main bus route making it easy to visit neighbouring towns and other more distant places. Like to try surfing or kayaking. We can help with great recommendations. A deposit of 50% of the total tariff is payable on booking. If you cancel with less than 21 days notice your deposit is forfeited. If less than 5 days notice the total cost of the reserved accommodation is payable. The balance of your account is due on arrival. No refunds are made if you leave before your departure date. Please bear in mind your booked accommodation is held exclusively for you and other enquiries will have been declined.